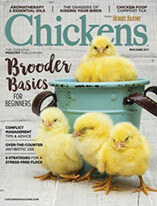 In this Q&A, an author and chicken expert advises readers about choosing chicks as well as a winter comb issue. Q: I’d like to purchase chicks in the spring during chick days from a farm-supply store. What should I look for when selecting from a tub of chicks, all of which look adorable? A: When you get to your local farm-supply store and are picking out your new baby chicks, look for curious, active birds with clear, bright eyes. The chicks shouldn’t be wheezing or coughing; be sure there’s no discharge from their eyes or nostrils. Although, like all babies, chicks do sleep a lot, don’t choose a weak-looking chick that is curled up in the corner while the rest are racing around in the brooder or one standing still with its eyes closed. The chicks should be standing up and moving around; check that their feet and toes are straight and their legs are centered underneath their body, not bent, twisted or splayed out to the sides. A bit of soft peeping is good; however, loud, strident peeping can indicate that a chick is too cold. Lastly, you’ll want to check the vent area to ensure it’s clean and fluffy—not pasted up with poop. Choose the most active, energetic chicks you can for a happy, healthy flock. Q: I’m new to chicken keeping, and I’m thinking about adding chicks to my small flock by purchasing some from a hatchery through the mail. How does that work? A: Believe it or not, day-old chicks have been successfully sent through the mail for more than a hundred years. Due to the fact that just before it hatches, a baby chick will ingest or absorb the yolk in the egg it hatches from, the chick can actually survive without eating or drinking for up to 72 hours. That yolk provides all the nutrients, energy and fluid the chick needs to survive during those first few days. This is nature’s way of allowing a hen sitting on eggs to continue to sit after the first chicks hatch to allow time for the remaining eggs to hatch without having to get up and find food for them all. As long as the chicks stay warm, they should arrive at your doorstep or post office in good health. Modern hatcheries include soft bedding and often will put in a pack of grow gel to give the chicks an even better chance at survival. Most also impose a minimum order to ensure the box will be full so the chicks will generate enough body heat for the trip or will include a heat pack in a small batch during the colder months. Some hatcheries will limit shipping to only the warm months. It’s a good idea to call your post office the morning the chicks are due to arrive and go pick them up as soon as they are unloaded from the truck. Bring some room temperature water with some sugar in it to give each chick a bit of an “energy drink” as soon as you get them. Q: I noticed some black spots on one of my hen’s combs this winter. What could it be? A: This time of year (winter), I would guess that you are looking at a case of frostbite, especially if the black is appearing around the edge or on the tips of the comb. 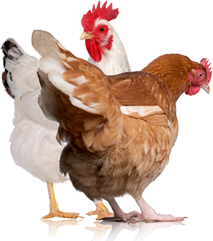 Chickens can suffer frostbite on exposed extremities such as combs, wattles, legs and toes in the winter. The black spots are dead skin tissue and won’t grow back, but they do help to protect the underlying tissue, so never try to break off any parts of the comb. Frostbite is often caused more by moisture in the air than by the cold itself, so it’s important that your coop has lots of ventilation up high near the eaves. If you see condensation on the insides of your coop windows, that’s one indication that moisture is building up in your coop instead of escaping and that you need more ventilation. To treat frostbitten areas as well as to prevent future frostbite, very gently smear some softened coconut oil or an antibiotic salve on the comb, being careful not to rub the affected skin. Some people feel that adding a bit of cayenne pepper to a flock’s feed in the winter helps increase circulation, which will result in increased blood flow to the extremities and presumably prevent frostbite. 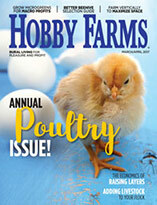 Post your poultry-related questions to Lisa on Facebook: www.facebook.com/hobbyfarmschickens.